be an easy task.' And in an instant his scales might be seen flashing quickly along. The fish swam as fast as he could to the sea, which was not far distant, and calling together all his relations who lived in the neighbourhood, he told them of the terrible danger which threatened the dwellers in the river. although he is so old, always goes everywhere. He will be able to tell you about it, if anyone can.' 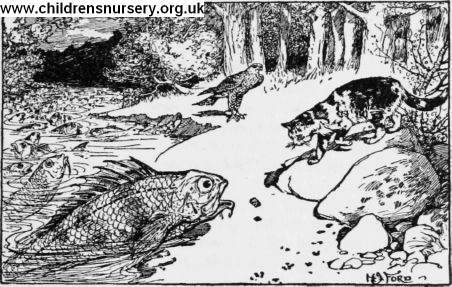 So the little fish swam off to the tunny, and again related his story. 'Why / was up that river only a few hours ago!' cried the tunny; 'and as I was coming back something fell into my ear, and there it is still, for I went to sleep when I got home and forgot all about it. Perhaps it may be what you want.' And stretching up his tail he whisked out the stone.